Every evening I try to block out at least twenty minutes of my time to enjoy a warm, fluffy bubble bath. It is a nice way to slow down my acrobatic brain and encourage my mind to prepare for resting through the night. It is also a huge help to my body because I suffer a lot with pain from past injuries. Yes, this old girl "ain't what she used to be", but thankfully, the hot water from my tub seems to temporarily pacify my aches and pains so that I am not as uncomfortable and fidgety during the time I've allotted for sleep. Anyway, last night while I was soaking, I was looking over the ten inch scar that remains on my left leg. It runs down the middle of my thigh, over my knee, and ends midway over my tibia. I've had many surgeries on this leg (and expect many more) because the knee and surrounding bones have proven unreliable due to a past accident. Without getting into all the gory details, I started to remember the day my leg was injured and the unthinkable pain that pushed me in and out of consciousness while gracious paramedics and hospital personnel did their best to assess and treat my many fractures. I have never endured such insurmountable pain and physical suffering as I did during this time. No amount of pain killers could prepare me for that trial, and I will never forget the blood-curdling screams that came out of me while being moved every which-way through the x-ray process, surgery, therapy, etc. It was terrible. Needless to say, it was a very difficult and extremely painful time of my life. When all this had happened, my dear husband (Chuck) dropped out of his busy travel schedule and "moved into" my hospital room to advocate on my behalf while continuing to carry the load of managing our work/life commitments. When I slept, my husband worked. When I was awake, my husband comforted me. I was so grateful because I could relax a little easier with him beside me - knowing that he was there to protect and watch over me no matter what. During this time, I had a lot of physical therapy to get through. Whenever my doctors and therapists would push me to do something challenging, Chuck would encourage me to keep going... to not give up... to push through the pain and focus on the goal of getting better. Whenever I would stumble or complain, Chuck was right there and ready to motivate - coaching me to lay aside my frustration and believe God was in control. And even though I felt like an ugly mess, Chuck would reassure and praise me - always telling me how beautiful I am to him, how much he loves me, etc. I am so thankful for Chuck's help through this trial. Because of him, I became stronger, healthier, focused. Because of his help, my spirit remained refreshed and I was energized to keep moving forward rather than sit in the pity party of what was now in the past. Yes, without my dear husband by my side, I don't know if I would have made it through my desperate, injured state. Oh, thank you, Lord, for giving me such a support! So anyway..., yesterday I was in the tub remembering all this while inspecting my scar. And it got me thinking about how much more my Savior had endured on the cross. I thought about the tremendous love and will that Jesus demonstrated during this dark and lonely time. Here was the Creator of the whole universe (who made our bodies to work a very specific way) being subjected to the worst physical suffering imaginable. I wondered when He was whipped and beaten - when His body began to bruise, if He thought about the capillaries under His distressed human tissue that had begun to break under the skin and allow His holy blood to build up. I wonder if He considered the nerve endings that He had designed and how now, on His own body, they would report the trauma back to His brain, disclosing the severity of His deadly situation. I wonder as the thorns dug into His scalp, if He thought about the day He skillfully fashioned blood to coagulate and clot whenever the body received damage. I wonder how wounding the sting of His tears felt as He looked lovingly into the eyes of those who came to hurt Him, condemn Him, murder Him. I thought about all this as I looked over my own scars and suddenly realized that even after overcoming death, Jesus chose to keep His scars. He kept the nail marks on His hands! Why? He didn't need to do that. He was a resurrected God! A King! Why keep ugly scars on your person when you are the Savior to all who believe and claim your name as Lord? Then I remembered doubting Thomas. How he could not accept the unbelievable news that Jesus lived! And I realized, Jesus kept his scars for us! His hands carry the marks of death so that we can always remember what He victoriously did for us! By merely looking at our Savior - we can know that our Messiah endured and overcame our greatest foe... death! AMEN! Friends, our lives on earth are not meant to be easy. God already knows that we will endure many hardships and likely be scarred in many, many ways from the sin that surrounds and entangles us. However, just like Jesus, we can use our scars to showcase His sacrifice and triumph. Just like Jesus, we can be a living example of God's love and victory over sin and death. It is crucial to understand that as we live on this earth, we are each in the process of undergoing our own spiritual therapy as we relearn how to walk in what is holy and healing. And with us... alongside us - is our faithful Savior, who through His own experience understands our need for encouragement. He has promised to accompany us... pushing us through our pain... motivating us to keep our focus on the goal of becoming healthier in His Name. Whenever we stumble, He will be there to help us get up again. Whenever we are frustrated, He is ready to teach us that God is in control. And no matter how ugly and worthless and messy we may feel, Jesus is ready to remind us how beautiful and precious and important we are to Him... how much He loves us. He is ready to refresh our spirits and energize our souls with His precious grace. Let us receive Him... seek Him... know Him... be with Him. Let's keep our dearest Husband by our side so we can make it through this desperate, injured, lonely, corrupt world. We need Him to get better. We need Him to become new. So let's lift Him up every day of our lives and thank the Lord for giving us His perfect support! Consider what trial you are presently facing; what hardship and pain you are currently enduring. I encourage you to think about it, and then put it into perspective. Consider the sacrifice your Redeemer has made to insure your safety and eternal security. Remember His grace. Remember His pain. 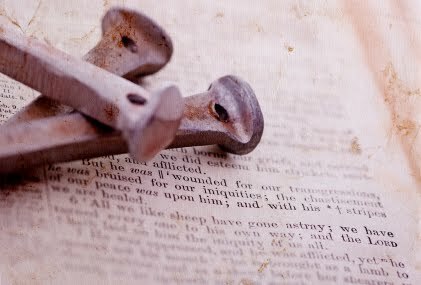 Remember what He endured and overcame for your benefit. Relax in the fact that He will always be with you... working toward your best interest... at the ready to protect and watch over you no matter what. This is your Comforter, your King. He loves you. Continue to allow Him to "move into" your heart and carry the load of your life. Let's keep our focus on what is truly important. No matter what comes, let's continue to fix our eyes on the Creator and Savior of this world. Bathing ourselves in His comfort. Remembering that He has fashioned all that we are... all that we will face... all that we must endure to become more like Him. He has perfectly planned to see us through. So, focus on His scars and believe in His grace. There is no One greater. There is no One mightier. There is no One that loves you more. Glory be the Name of our Redeemer. Blessed be the Name of Jesus Christ our Lord!